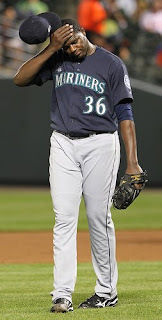 Mariners Latest: M's Ground Out To Spank Yanks! M's Ground Out To Spank Yanks! Michael Pineda had a rough night and ran into a lot of trouble. Trouble named Mark Texeira in the first when he smashed a homerun over the right field wall. Trouble with control which I believe was a bit of the Yankee jitters, facing them for the first time!!! Pineda said that he didn't have command of his slider or his fastball, which are basically his two pitches. All that being said, Pineda did give up 3 earned runs but on only 3 hits through 5 innings. The 5 walks to match his 5 strikeouts is what really got him in trouble. Thanks to Franklin Gutierrez the damage was limited as he took a surefire homerun away from Nick Swisher in the fourth. Guti hasn't missed a beat in the outfield since coming back. What a play! Seriously though! 4 runs for the M's, all on groundouts in the infield. We put runners in scoring position 8 different times and went 0 - 8 in those situations, but the outs we made were productive. Brendan Ryan's hustle comes into play once again as he stayed out of a double play allowing a run to score and advance another runner into scoring position. Ichiro got an infield out that scored a run, Luis Rodriguez and Justin Smoak did as well. So we beat the Yanks with 6 hits and getting good outs. Productive outs! Pineda didn't get the win, but didn't get a loss and I'm sure he'll take that. The M's continue to find ways to win and find themselves back at .500 and only a half game out of first place. Figgins had a needed day of rest as L-Rod played third and batted second in his place, but I'm sure he'll be in the lineup tonight. Tonight the Yanks have to face King Felix who is notoriously amazing versus the Yankees lineup. Let's hope that tonight we see more dominance from him. Just a side note, the M's haven't lost a game with Gutierrez in the lineup.